The kielbasa recipe hasn’t changed much since Peter May, a Polish immigrant, opened a grocery store in Kansas City’s Blue Valley neighborhood in 1929. Customers can count on the same fresh meat, no preservatives, spiced with a mixture passed down through the family. The location is the same, too. Peter May’s House of Kielbasa still operates out of the 1600 block of Bristol Avenue, situated in a once-busy enclave of factories, homes, churches and businesses. But May’s descendants who have stuck with the family business over four generations and nine decades, including granddaughter Linda Loges, have seen their small corner of Kansas City crumble around them. The factories are closed. The shops, gone. The houses that provided a gateway to home ownership for blue-collar families are disheveled rentals alongside vacant, littered, lots. People in and around Loges’ neighborhood tell of squatters swiping people’s trash, riffling through it and dumping the bags on a neighborhood street, and of vandals destroying a garden, including a 3-year-old bush cherry tree that had brought a bit of cheer. Linda Loges has lived in the neighborhood all her life. Her parents owned the sausage shop and cafe, and now her son, Mike Loges, runs the place. She worked for years as cafeteria manager at nearby McCoy Elementary School. That’s gone, too — shuttered in 2010 and demolished in 2013. Linda’s husband, John Loges, is a retired Kansas City police officer. They live across the street from Peter May’s. When they shop for groceries, they have to drive into neighboring Independence, Missouri. Two supermarkets that used to operate on Truman Road are closed. 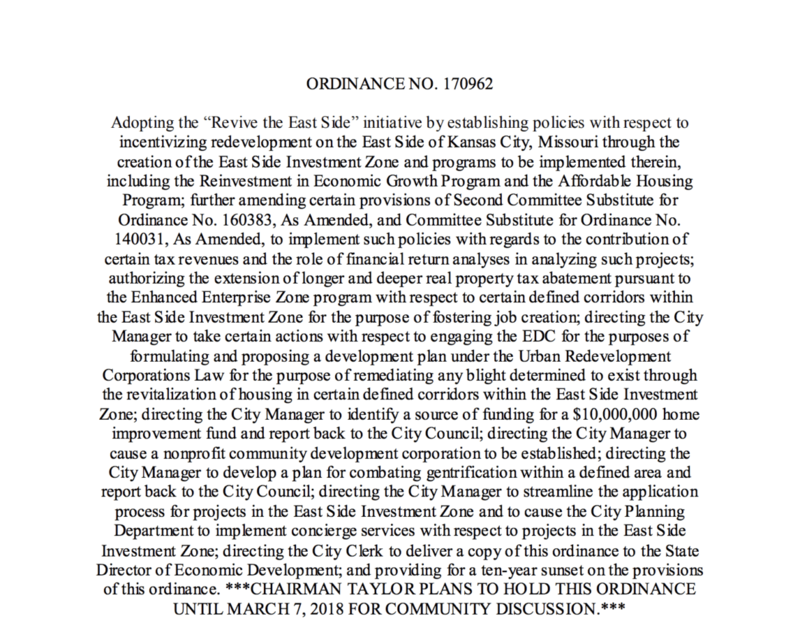 But, as is often the case in city elections, revitalization of Kansas City’s sprawling East Side is a front-burner issue in the current race for mayor and City Council. 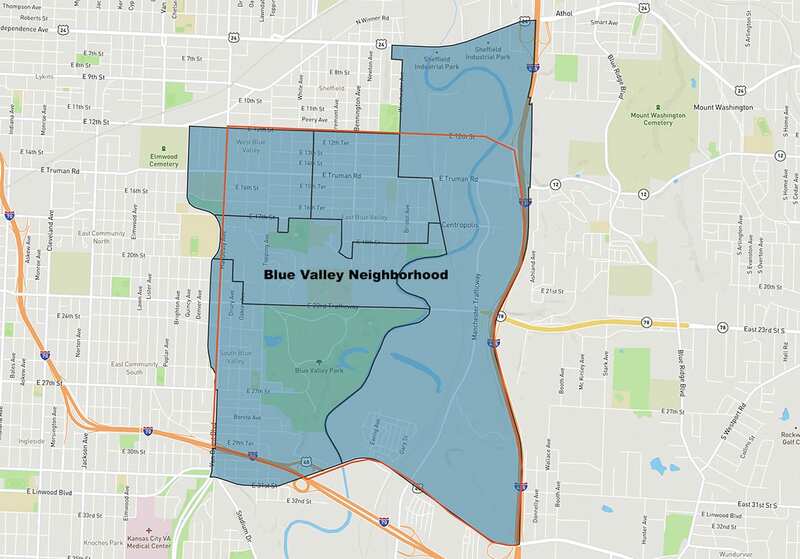 Blue Valley is part of the council’s 3rd District, which will have two new representatives after the June 18 general election. Meanwhile, mayoral candidate Quinton Lucas is currently the at-large representative from the 3rd District, and his opponent, Jolie Justus, represents a City Council district that abuts Blue Valley to the north. So, will this injection of new blood on the City Council finally bring about lasting solutions for blight in Blue Valley? Will Lucas or Justus bring to bear their council experience to remember that the East Side extends far beyond the urban core to neighborhoods east of Van Brunt Boulevard? And, finally, will the new elected leaders at City Hall follow through on ambitious housing revitalization plans conceived by the current council, including a $10 million home improvement fund in the “Revive the East Side” plan, and a $75 million housing development trust fund in its five-year housing plan? People like Nancy Simons will believe it when they see it. Progress, when it comes, is hard-gained. It seems like it’s one step forward, two steps back. A couple of years ago, Tikkun-KC, a not-for-profit group that specializes in fixing up properties in distressed neighborhoods, acquired nearly all of the properties on the block of East 27th Terrace between Van Brunt and Oakley Avenue. That was the easy part, said Larry Myer, Tikkun’s executive director. Most of the lots were abandoned properties held by Land Bank of Kansas City. An owner donated a remaining property. After that, things got wild. One of the back yards was so overgrown that Myer’s workers discovered not one, but two, abandoned garage-like structures completely concealed by vegetation. After a drug house opened on a nearby corner, Myer stationed an armed guard beside his supply truck. Despite the hassles, Myer is proud of his work in Blue Valley. A block that had been a disaster now has six first-time homeowners and three attractive lots. Another investor purchased an eight-unit apartment building and fixed it up. “For the first time last summer we saw little kids playing in the street,” Myer said. But Myer isn’t sure he’ll undertake another project in Blue Valley, at least for awhile. Other city neighborhoods have similar needs and he finds them easier to work in. “There’s so much blight and a lot of the houses are really, really small,” he said. 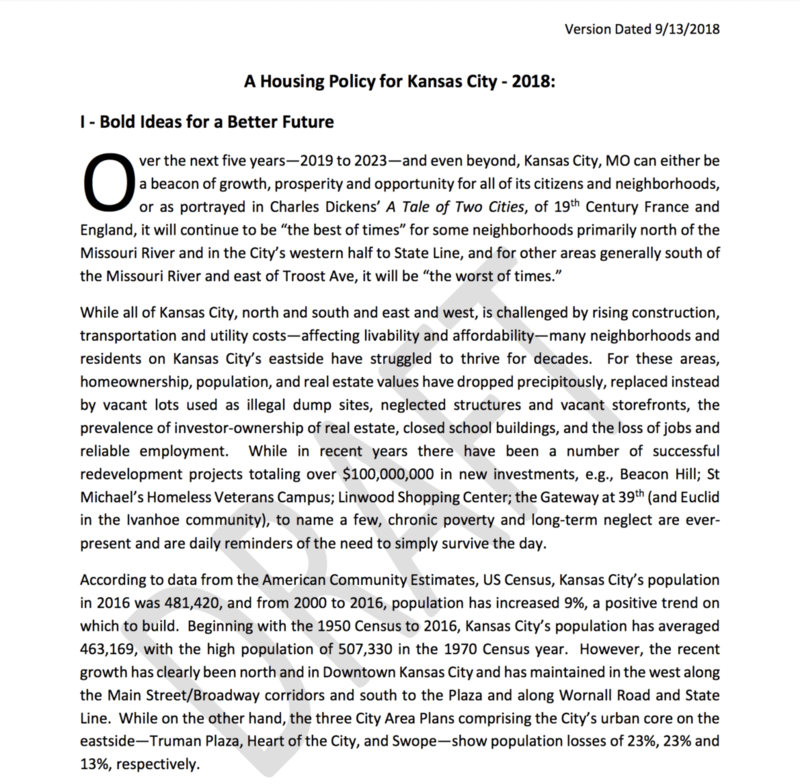 John Wood, assistant city manager and director of the Kansas City’s Neighborhoods and Housing Services Department, agreed that Blue Valley and other deteriorating city neighborhoods face big challenges. And city government alone can’t save them. Yet Wood is part of the administrative team that the new mayor and City Council will rely upon to implement initiatives aimed at improving Blue Valley and the rest of the East Side. The city is also depending upon organizations like Neighborhood Legal Support for Kansas City, which is headed by Gregg Lombardi. He sees opportunity in Blue Valley’s small homes and lots. Lombardi, former executive director of Legal Aid of Western Missouri, created the legal support group to boost community development in urban neighborhoods. Much of his work involves clearing up title issues so properties can be put to better use. Lombardi has seen investors purchase and remodel houses for as little as $50,000. “You can convert that into a mortgage that’s under $500 a month,” he said. And Kansas City’s northeast remains a first stop for immigrants and refugees eager to plant roots, Lombardi said. Much of Lombardi’s optimism comes from his work in the Lykins neighborhood, just north and east of Blue Valley. That area has become a magnet for rehabbers. New families are moving in and small businesses are opening up. The neighborhood association has agreed on a community development plan designed to both encourage more investment and protect long-time residents from rising property taxes. The revival in Lykins has been aided by the Urban Farming Guys, a group of young families who moved into the neighborhood about 10 years ago with the goal of strengthening a distressed community. They have built a “campus” in Lykins that includes farm plots, a co-working space, greenhouses, a tool library, an aquaponics farm and a space for neighborhood meetings, classes and youth activities. The Urban Farming Guys have built relationships with other neighborhood leaders and Lombardi’s group to create a synergy and energy that Blue Valley lacks at the moment. Blue Valley residents who are engaged — like the regulars at neighborhood association meetings — tend to be old timers doing their best to keep things from falling apart altogether. They are a tough, loyal group — much like the family of Peter May. Mike Loges, great grandson of the founder, lives in Independence, Missouri, with his family. But he still drives to Blue Valley nearly every weekday to run the kielbasa business. Peter May’s serves breakfast and lunch to cops, firefighters and a few neighbors who wander in. Much of its business is selling Polish sausages to long-time customers who have moved elsewhere. Loges is 40, and Blue Valley has decayed before his eyes. He remembers happier times, when stores were open and people walked the streets and called each other by name. He would love to see Blue Valley thrive again. But, much like Simons, the neighborhood vice president, he isn’t holding his breath. That’s a shared belief throughout Blue Valley. And it will take a lot of work to change people’s minds.